Social scientists have proposed various explanations for age gaps in religious commitment around the world. One common explanation is that new generations become less religious in tandem with economic development – as collective worries about day-to-day survival become less pervasive and tragic events become less frequent. According to this line of thinking, each generation in a steadily developing society would be less religious than the last, which would explain why young adults are less religious than their elders at any given time. Rising education levels are often closely tied to economic development. Some theorists suggest education could reduce religious identity and practice, although empirical findings about the relationship between education and religion are complex.2 In societies where access to education is spreading and the average number of years of schooling is rising, younger generations tend to receive more education than their parents and grandparents did. Directly or indirectly, this increase in education could be part of why younger adults are less religious. Another theory is that differences in religious commitment reflect change during the life course. Although young adults often start out less religious than their elders, they tend to become more devout as they age, have children and begin to face their own mortality (or so the theory suggests). These explanations are not mutually exclusive – it is possible that young people will become more religious as they age, but will still be less religious than previous generations if their countries become more affluent and stable. 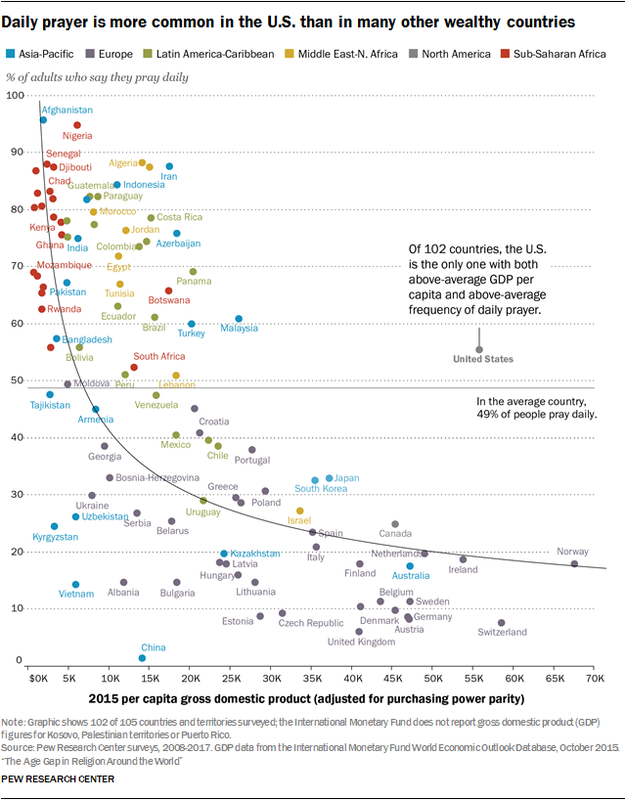 Pew Research Center surveys and other international data provide some evidence for both societal and life-course influences on religious commitment. Variations in religious commitment also can be attributed to differences in the way countries – and often whole regions – developed historically, and how each society practices religion. Even though these differences do not directly explain the existence of age gaps, they affect how successive generations experience religion and respond to questions about observance. 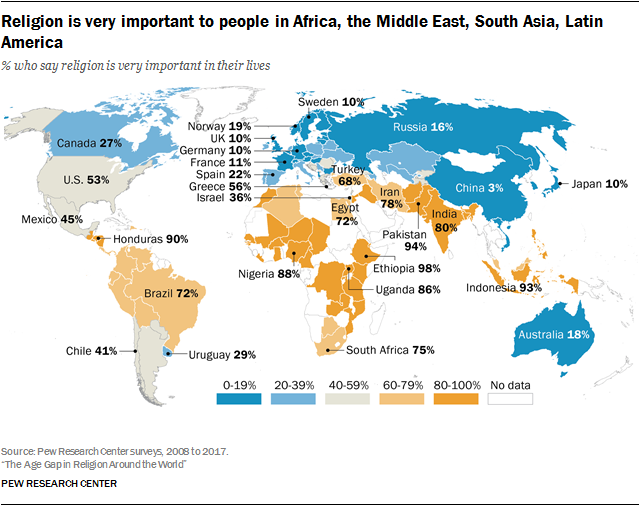 As the map above shows, the countries with the highest shares of people who say religion is very important in their lives are in Africa, the Middle East, South Asia and Latin America, while those with the lowest shares are in Europe, North America, East Asia and Australia. 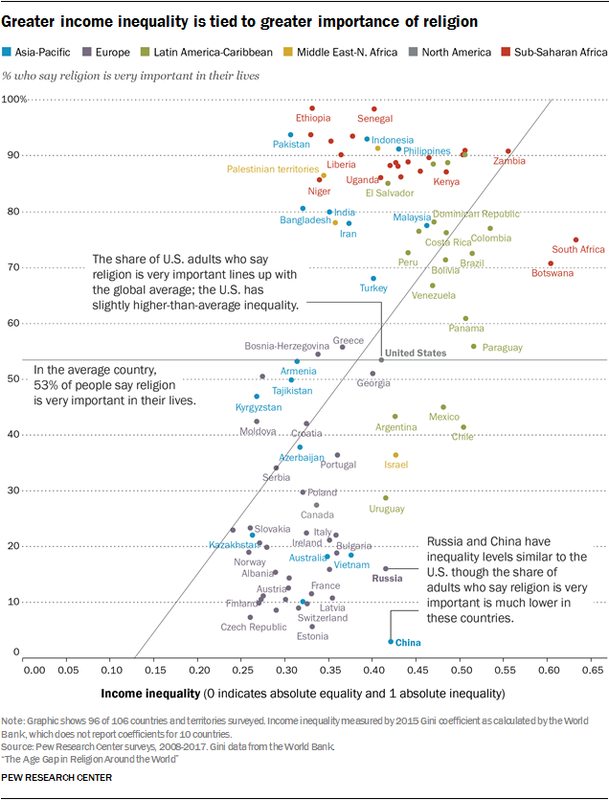 This has led many researchers to observe that people in poorer parts of the world are, on average, more religious than those in societies with advanced economies.3 Other indicators of economic development – such as education, life expectancy and income equality – also tend to align with measures of religious commitment. 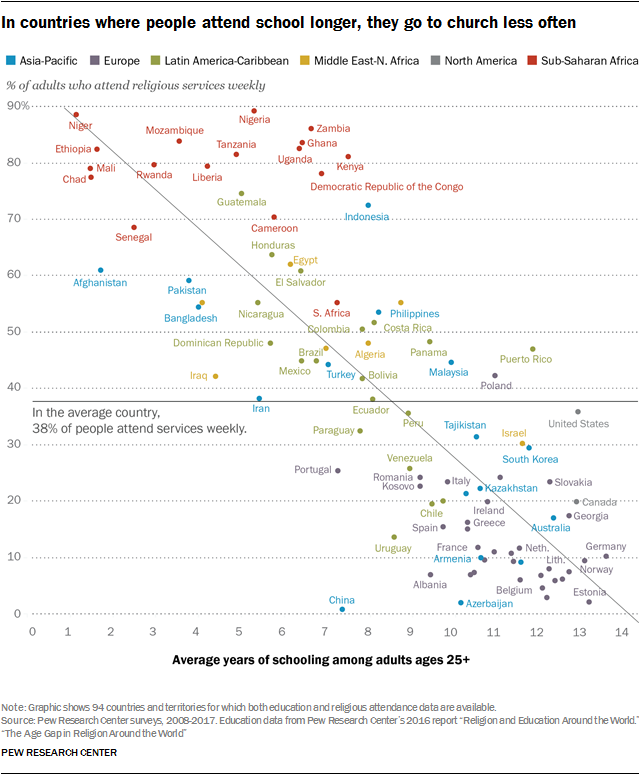 Pew Research Center data show, for example, a clear correlation between life expectancy at birth in a country and the percentage of its people who attend religious services weekly. 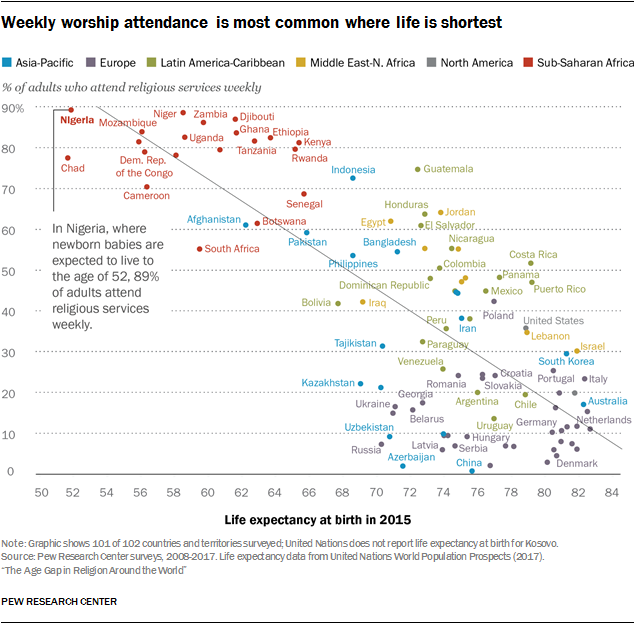 That is, the higher the life expectancy in a country, the less likely people are to attend services frequently. As their theory goes, in places where people face a constant threat of premature death due to hunger, war or disease, feelings of vulnerability tend to drive people to religion, which in turn provides hope and reduces anxiety. In countries with advanced economies, meanwhile, people are more likely to feel safe – in part because technology and infrastructure investments in these societies have helped people overcome many common health problems, cope with severe weather, and deal with other types of emergencies that can cause existential anxiety. Norris and Inglehart contend that people in these countries rely less on religion for emotional support or for explanations of the unknown. When new cohorts of adults grow up in societies with greater existential security than their parents had – as may be the case in a country with improving economic conditions – young adults may drift away from religion, producing the age differences described in this report. By the same token, a decline in existential security within a country that falls into civil war or some other calamity could help to explain some of the exceptions – places where younger adults are more religious than their elders (see sidebar in Chapter 2). Can tragedies increase religious commitment levels? Do large-scale catastrophes such as famines, wars and earthquakes spur increases in religious behavior? It’s hard to tell, because researchers usually lack comparative data from before and after a disaster. An exception, though, is a February 2011 earthquake in New Zealand that resulted in 185 deaths and thousands of injuries. From 2009 to 2011, the Canterbury region showed a net gain in religious affiliation of 3.4%. That compares with a 1.6% net drop in religious affiliation across the rest of New Zealand during that same period. In a separate study, the economist Jeanet Sinding Bentzen found that people living in places where earthquakes and other unpredictable natural disasters, such as tsunamis and floods, recently occurred are more religious than people living elsewhere.6 Likewise, among victims of Hurricane Katrina, which battered the Gulf Coast of the United States in 2005, 67% reported becoming more religious as a result of the trauma.7 Survivors whose religious commitment increased also had lower rates of mental illness and suicidal thoughts following the hurricane than others. Several measures besides life expectancy at birth can be used to measure existential security within countries. For example, education is a common proxy for prosperity and development. Plotting the average number of years of formal schooling adults have completed in each country alongside the share of adults who attend religious services at least weekly shows that more education is associated with less frequent religious service attendance. Indeed, most countries in sub-Saharan Africa have high percentages of adults attending religious services weekly and relatively few years of completed schooling, on average. Conversely, European countries tend to have lower rates of weekly attendance and more years of schooling. Regional clustering is apparent on this measure, too. Nearly every country in sub-Saharan Africa has a per-person GDP under $10,000 and above-average rates of daily prayer. European countries are scattered across the full range in terms of GDP, but the only one with a rate of daily prayer at or above the global average is Moldova, which has Europe’s lowest GDP per capita. Similarly, the only country in the Middle East-North Africa region where fewer than 50% of adults pray every day is Israel, which also has a markedly higher GDP than the other countries in the region for which survey data are available. Overall, regardless of how religious commitment or prosperity are measured, the general pattern holds: Religious commitment is lower in places where life is easier. And in places where life is steadily becoming easier, the theory goes, younger adults generally are less religious than their parents’ and grandparents’ generations. Does aging itself make people more religious? Many scholars also point to the aging process itself as an explanation for why young people are less religious than their elders. In a sense, this dovetails with the “existential insecurity” argument: Growing older and nearing the end of one’s life could produce a sense of existential worry in an individual, regardless of how comfortable the conditions are in their country. Data gathered in Western countries in particular indicate that religious identity and commitment often change throughout the course of people’s lives, as they leave their parents’ homes, start families, advance in their careers and age through retirement. Economists have applied profit motive – the idea that most decisions are inspired by the quest for financial gain – to this question.13 One research team concluded, based on survey data and church-membership records, that people in early adulthood focus more on making money than on religion, and that religiosity tends to decline during this peak earning phase. In their later years, this team posits, most people decide to build up the “religious capital” they believe will help them after death. Another theory, drawn from psychology, is that people actually develop new values during life’s later decades, distinct from the values of midlife, leading to greater spirituality and satisfaction. 14 This theory of “gerotranscendence” is based on survey research showing that many older people report being less self-centered than they were previously, as well as feeling more connected to others and institutions beyond themselves. While there is ample recent evidence to suggest that younger adults tend to be less religious than their elders, it would be a mistake to assume that this tendency always holds true. The global data analyzed in this report come from surveys conducted over the past decade, capturing only a brief snapshot of religious commitment and shedding little light on how peoples’ religious habits change over time. This limitation is largely unavoidable because there is a dearth of longitudinal data on this topic in many countries. In the U.S., however, researchers have collected data on religious commitment for decades, and an in-depth look at the results suggests that younger Americans have not always been less religious than their elders, challenging the notion that older people are naturally more religious. Gallup surveys dating back nearly 80 years show that in 1939, 39% of Americans ages 40 and older and 36% of U.S. adults younger than 40 claimed to have attended church in the last week. Both groups saw a rise in attendance in the postwar period – the early years of the Cold War – and by the late 1950s, the modest age gap had closed. Over the next 10 years, as the U.S. experienced rapid economic growth, the two age groups moved apart, and that gap has persisted through several decades. If anything, the gap has grown in recent years as attendance rates among young adults have fallen. Looking at four age groups (rather than two) reveals even more clearly that religious service attendance and age have not always correlated perfectly in the United States. From the early 1940s through the 1960s, people in their 40s and 50s reported attending at least as frequently as those over 60. And adults in their 30s saw a spike in attendance in the late 1950s, briefly matching or exceeding the other groups. By the mid-1970s, the age groups had split into the pattern seen today: Older adults are more religiously committed than younger adults. 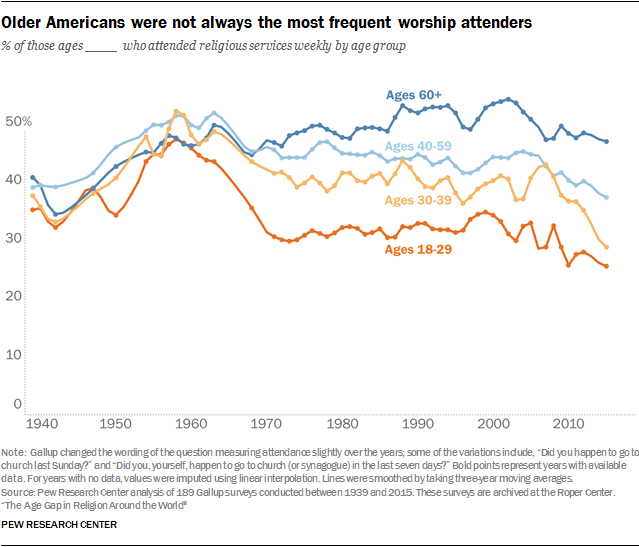 Although these data do not rule out life cycle effects, they show that Americans of all ages experienced a boom in religious attendance in the post-World War II years, and younger Americans in the late 1950s reported attending at least as often as their elders. 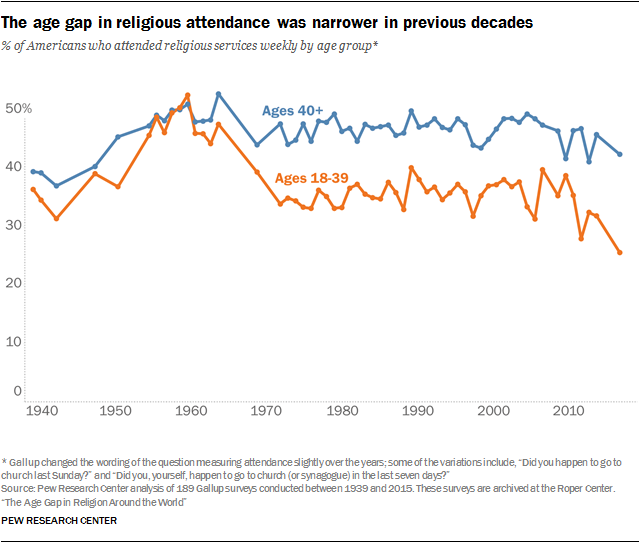 More recently, younger Americans have reported less frequent religious service attendance than older adults. Religious trends in the United States may be different from those in the rest of the world. Like many of their peer nations, Americans enjoy a high standard of living, high rates of literacy and education, a developed economy, and a representative democracy. However, compared with other similarly developed countries, the U.S. has relatively high levels of economic inequality, infant mortality and imprisonment rates.15 Americans also are more religious by most measures than others in similarly developed economies.